Waterford Crystal Irish Lace Bowl 10 Ireland Cut Crisscross Lead Glass #149575. Waterford Irish Lace Lead Crystal Bowl. Clear cut vertical and crisscross pattern. Measures 10 1/4" in diameter x 5 7/8"H. Or sign up for our Newsletter. Showing our latest monthly sales. 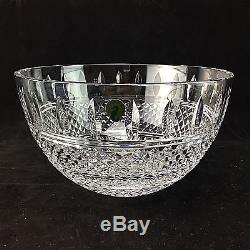 The item "Waterford Crystal Irish Lace Bowl 10 Ireland Cut Crisscross Lead Glass #149575" is in sale since Monday, February 27, 2017. This item is in the category "Pottery & Glass\Glass\Glassware\Waterford". The seller is "dudahdavey" and is located in Rancho Mirage, California. This item can be shipped to United States, Canada, United Kingdom, Denmark, Romania, Slovakia, Bulgaria, Czech republic, Finland, Hungary, Latvia, Lithuania, Malta, Estonia, Australia, Greece, Portugal, Cyprus, Slovenia, Japan, China, Sweden, South Korea, Indonesia, Taiwan, South africa, Thailand, Belgium, France, Hong Kong, Ireland, Netherlands, Poland, Spain, Italy, Germany, Austria, Israel, Mexico, New Zealand, Philippines, Singapore, Switzerland, Norway, Saudi arabia, Ukraine, United arab emirates, Qatar, Kuwait, Bahrain, Croatia, Malaysia, Brazil, Chile, Colombia, Costa rica, Panama, Trinidad and tobago, Guatemala, Honduras, Jamaica, Antigua and barbuda, Aruba, Belize, Dominica, Grenada, Saint kitts and nevis, Saint lucia, Montserrat, Turks and caicos islands, Barbados, Bangladesh, Bermuda, Brunei darussalam, Bolivia, Ecuador, Egypt, French guiana, Guernsey, Gibraltar, Guadeloupe, Iceland, Jersey, Jordan, Cambodia, Cayman islands, Liechtenstein, Sri lanka, Luxembourg, Monaco, Macao, Martinique, Maldives, Nicaragua, Oman, Peru, Pakistan, Paraguay, Reunion.